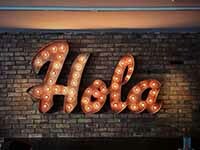 This basic conversational class is for students with no prior Spanish knowledge. Engaging learning activities focus on the development of practical language usage in everyday life: introductions, meeting new people, descriptions of others, numbers, clothing, colors and other basic vocabulary. Students master the basics of pronunciation, spelling, and present tense while participating in activities that also increase their knowledge of the Spanish- speaking world.